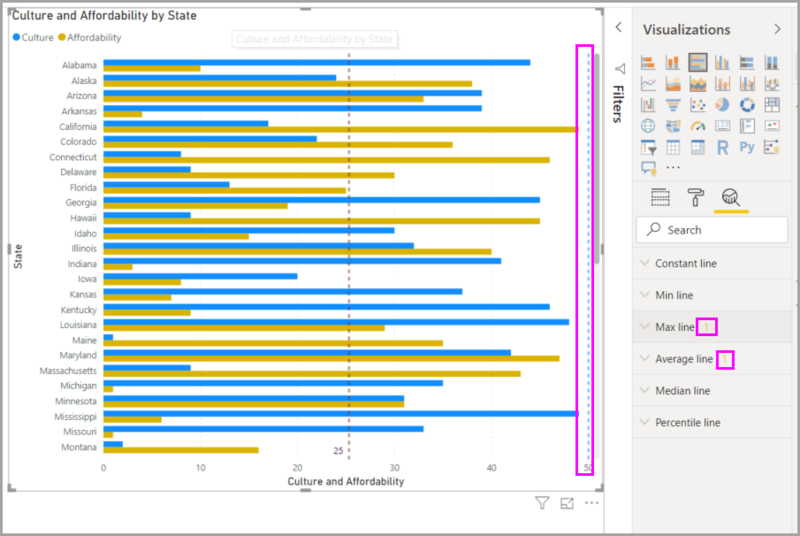 With the Analytics pane in Power BI Desktop, you can add dynamic reference lines to visuals, and provide focus for important trends or insights. 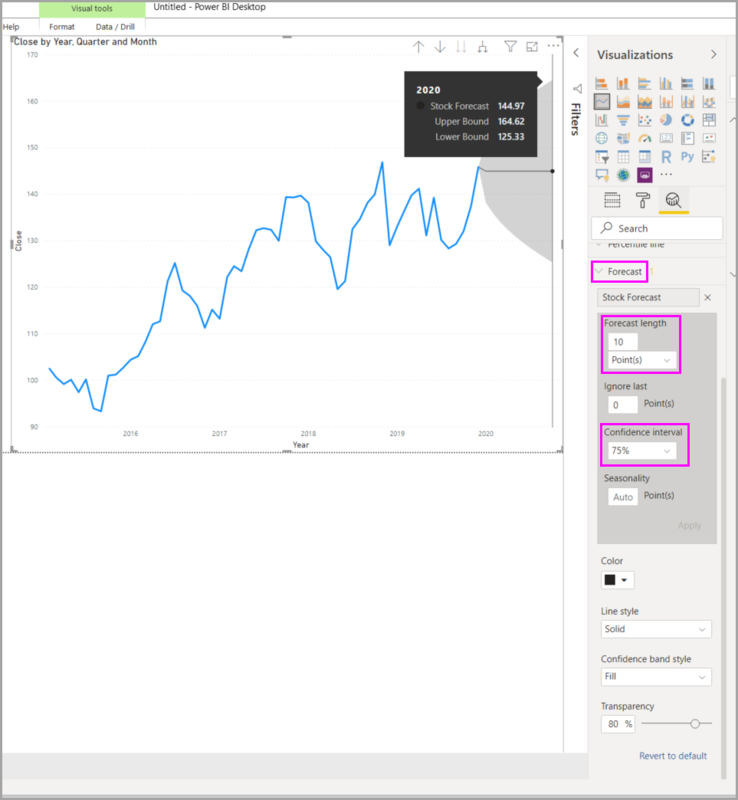 The Analytics pane is found in the Visualizations area of Power BI Desktop. 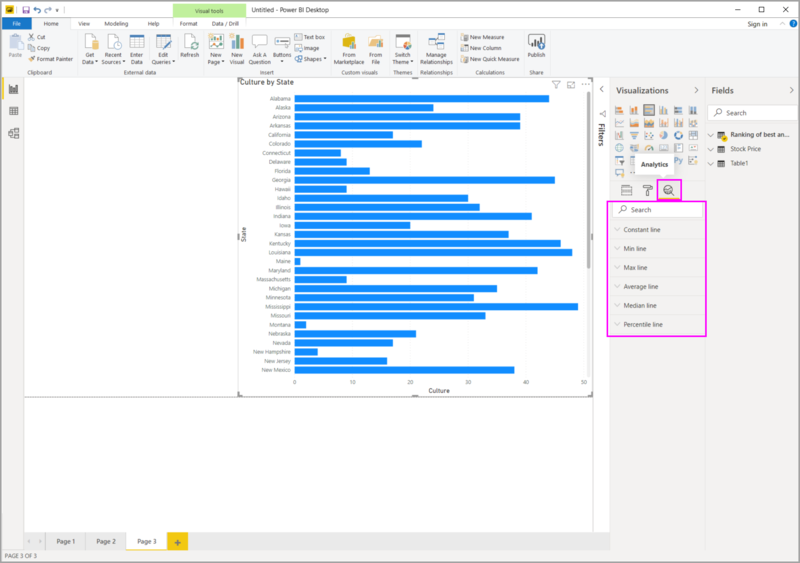 The Analytics pane only appears when you select a visual on the Power BI Desktop canvas. 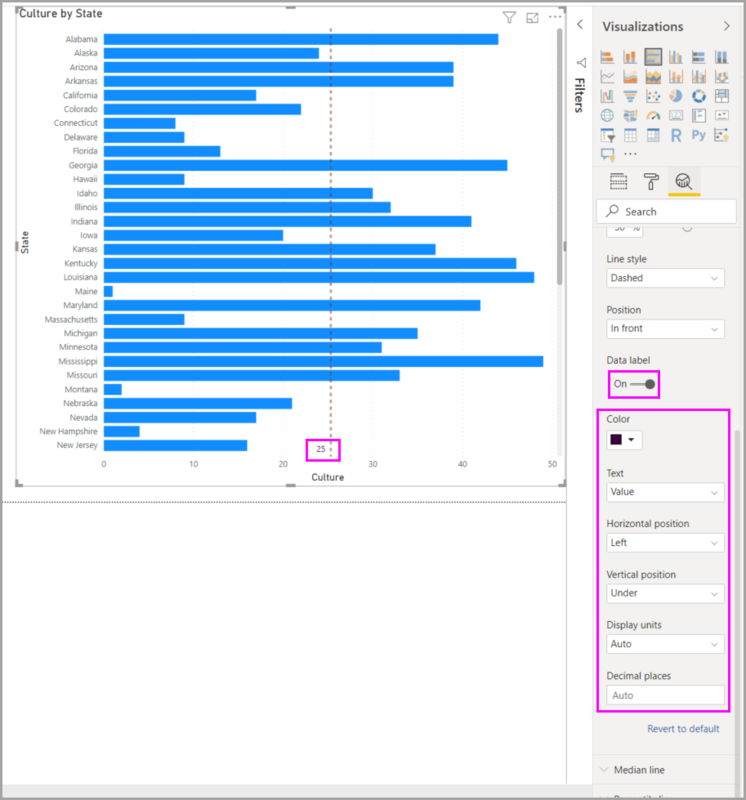 Beginning with the February 2018 release of Power BI Desktop (version 2.55.5010.201 or later), you can search within the Analytics pane, which is a sub-section of the Visualizations pane. As shown in the image below, search box appears when the Analytics pane is selected. 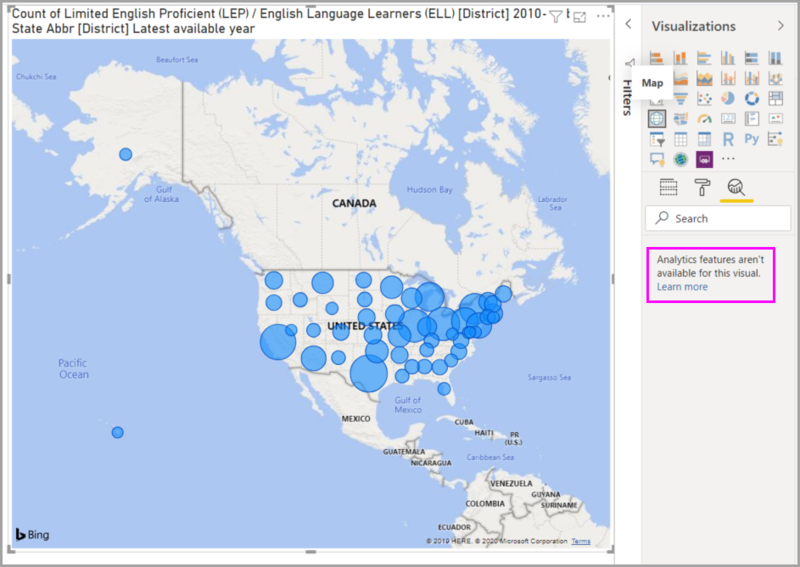 The following sections show how you can use the Analytics pane and dynamic reference lines in your visualizations. Select or create a visual, then select the Analytics icon from the Visualizations section. Select the down arrow for the type of line you want to create to expand its options. In this case, we'll select Average Line. To create a new line, select + Add. You can then specify a name for the line by double-clicking the text box, then typing in your name. You have all sorts of options for your line, such as selecting its color, transparency, style and position (relative to the visual's data elements), and whether to include the label. And importantly, you can select which Measure in the visual you want your line to be based upon by selecting the Measure drop-down, which is automatically populated with data elements from the visual. In this case, we'll select Weather as the measure, label it Average Weather, and customize a few of the other options as shown below. If you want to have a data label appear, move the Data label slider on. When you do so, you get a whole host of additional options for your data label, as shown in the following image. Notice the number that appears next to the Average line item in the Analytics pane. That tells you how many dynamic lines you currently have on your visual, and of which type. If we add a Max line for Cost of Living, you can see that the Analytics pane shows that we now also have a Max line dynamic reference line applied to this visual. If the visual you've selected can't have dynamic reference lines applied to it (in this case, a Map visual), you'll see the following when you select the Analytics pane. 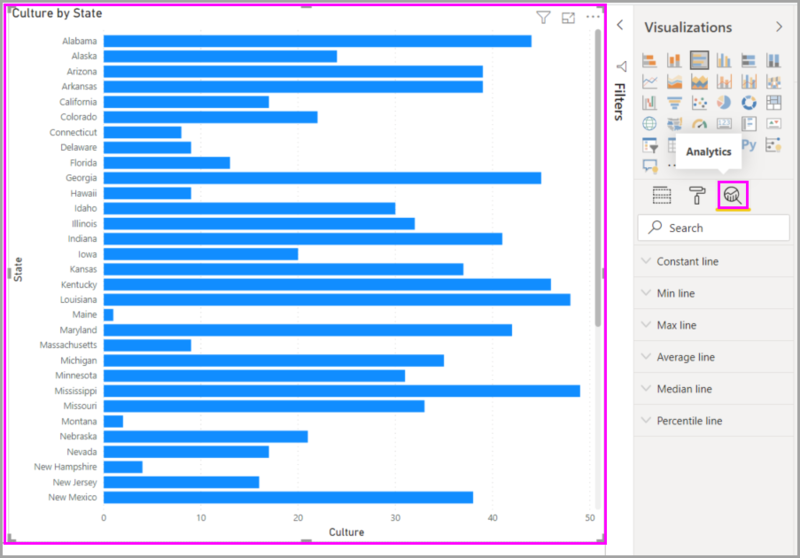 There are all sorts of interesting insights you can highlight by creating dynamic reference lines with the Analytics pane. We're planning more features and capabilities, including expanding which visuals can have dynamic reference lines applied to them, so check back often for what's new. You can use the Forecast feature by selecting a visual, then expanding the Forecast section of the Analytics pane. You can specify many inputs to modify the forecast, such as the Forecast length, the Confidence interval, and others. The following image shows a basic line visual with forecasting applied, but you can use your imagination (and play around with the forecasting feature) to see how it can apply to your models. 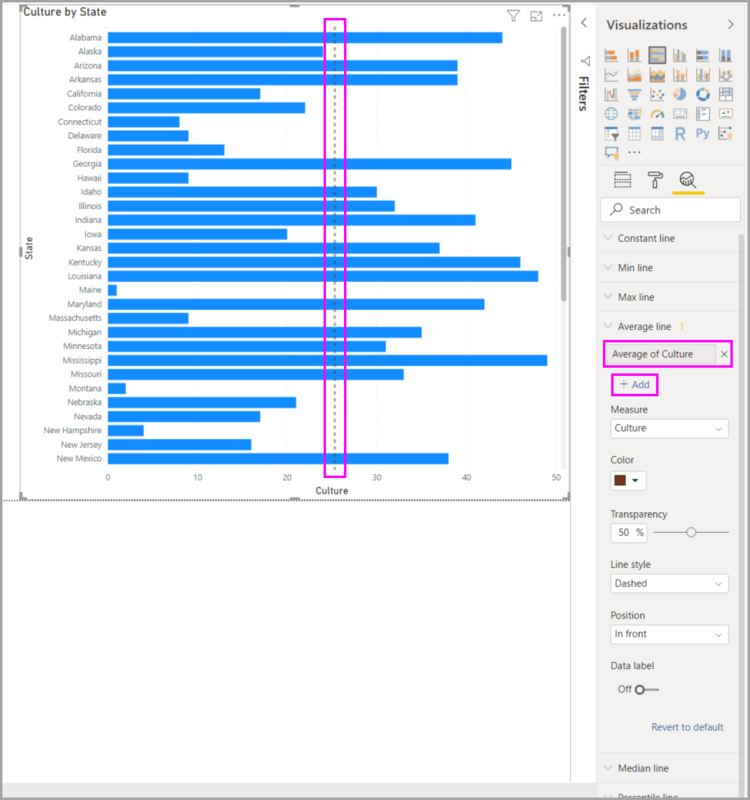 The percentile line is only available when using imported data in Power BI Desktop or when connected live to a model on a server running Analysis Service 2016 or later, Azure Analysis Services, or a dataset on the Power BI service.